I was packing my tea when I discovered that I had this ripe tea pu erh tea cake. I checked my notes and found out that I had purchased this inexpensive cake in Kunming in 2009. I had even had a sample taste before I made the purchase. I was told that this was a 2005-06 ripe tea. This is a generic tea wrapper, that uses the "Tong Qing Hao" printed wrapper. This was an old tea factory that had closed down many years ago. Perhaps using such generic wrappers would helped the sales of tea at this tea shop. Anyway, after about 4 years of storage in hot and humid Singapore, I decided to open this cake. No surprises but I had expected more from his 8 year old cake. The tea was weak in both aroma and taste and lasted 5 infusions before weakening. I conclude that lower grade tea leaves might had been used to make this tea. A lesson learnt - that I should not be smitten by the tea wrapper. I had made my purchase where I had judged the tea by the wrapper. After my tea stop at Lau Yu Fat Teashop, I took a bus to Sin Fook Teashop. It was a quick 10 min bus ride. Formerly located at Kowloon City Shopping Mall, the shop had relocated a few streets away and are now at 83, Tak Ku Ling Road, Kowloon City. It was not difficult to locate. But I digress. 2 things you must do while in Hong Kong - 1. Get an 'octopus' card. Buy it at train/subway stops. Its a stored value card that allows quick entry/exit of trains, buses and minibuses. You can use it in supermarkets, covenience stores and at most fast food restaurants. 2. Get a pre-paid phone card. I got a 'China Mobile' card on my iPhone (HK$60) where you are loaded with a talk and data facility, and you can use it even in mainland China. It was invaluable as I use maps and Whatsapp apps frequently during my trip. 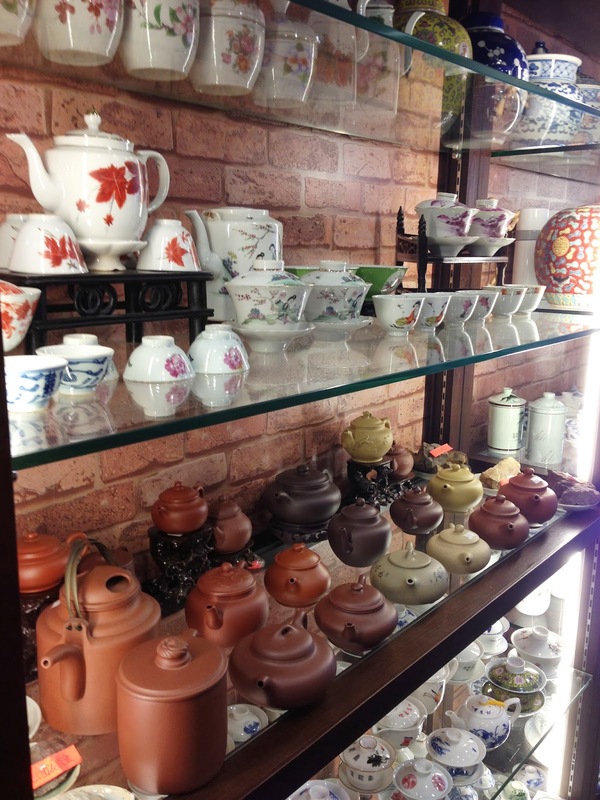 Sin Fook Teahouse mainly cater to local tea drinkers and collectors. Yes, you can sample the teas on sale there. A fairly good choice of tea and tea accessories are for sale and I enjoyed my visit every time at this teashop. I managed to meet tea blog celebrity, Marshaln later in the evening in Central, Hong Kong and as usual he was very generous in giving me a 2003 Dayi tuo (last pix). Thank you. Marshaln brought me to Dragon Tea House, a recently opened tea shop. Located at shop 116, 1F, Welland Plaza, 368 Queen's Road Central, Sheung Wan. This shop is a little hard to find, but worth a visit only if you are in the area. You would also have observed from the last pix that I had also snagged some moon cakes which were available during my trip in Hong Kong. I was on a business trip in Hong Kong last week and I set aside half a day for Chinese tea. I dropped by at Lau Yu Fat teashop. 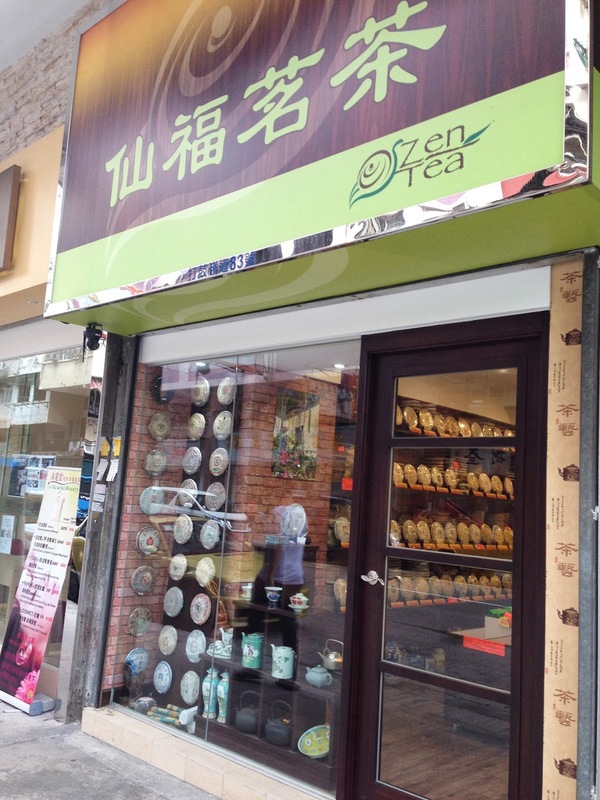 This teashop is very convenient to visit as it sits on top of Lok Fu train stop (subway) in a shopping mall. Mr Lau Senior was in the shop and I had a wonderful tea sampling session with him. 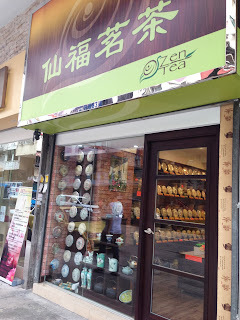 This time he explained in detail and allowed me to sample the various traditional Hong Kong stored pu erh. He explained that many new pu erh tea drinkers may think or assumed that such stored tea are 'old' tea due to its taste but the tea may be only less than 10 years old. He remarked it was important to be able to distinguished such teas, as it will help a tea drinker in choosing his tea. Hong Kong storage pu erh is pu erh tea stored in Hong Kong tea warehouses. These warehouses would usually have higher humidity levels, as these warehouses are located in the Hong Kong countryside. Pu erh tea stored at these places are not tempered in any way. Its only the way that the tea is stored. Mr Lau showed me pictures of his tea warehouse - it is very clean, and the tea are packed neatly in clean cardboard boxes on metal shelves. Hong Kong storage pu erh does taste like aged pu erh with an additional unique scent, something like damp wood. This additional scent is very faint and will however dissipate within a year or two, when the tea is taken out of the warehouse and stored in the teashop. Lau Yu Fat Teashop is a fun place to visit; for me at least - so many teas and tea accessories neatly arranged and labelled. Mr Lau told me to purchase a Lin Ceramics teapot (4th pix) and tells me that with extended use, pu erh tea brewed from this teapot would taste softer. MasterCard time.